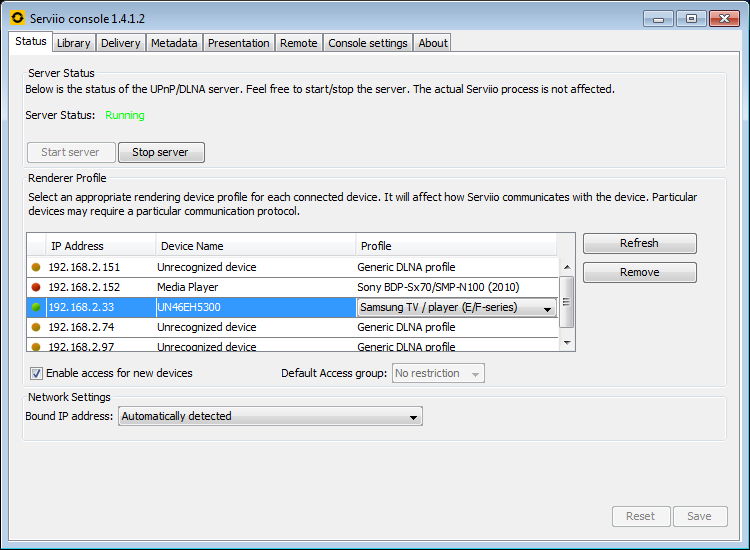 Recently my DLNA setup based on Serviio version 1.4.1.2 running under Windows 7 inexplicably started to not recognize newly-added videos. When attempting to browse them via my Samsung smart TV, the latest entries did not appear. Serviio console, showing status and devices configured for streaming. I hadn't dramatically changed the file and folder structure from which Serviio streams recently, nor had I made any huge changes to the configuration of Serviio nor my server. Finally though I found a solution which seems to have done the trick. It involved simply configuring Windows' file and folder permissions and file sharing permissions to allow the Everyone group to have read access. 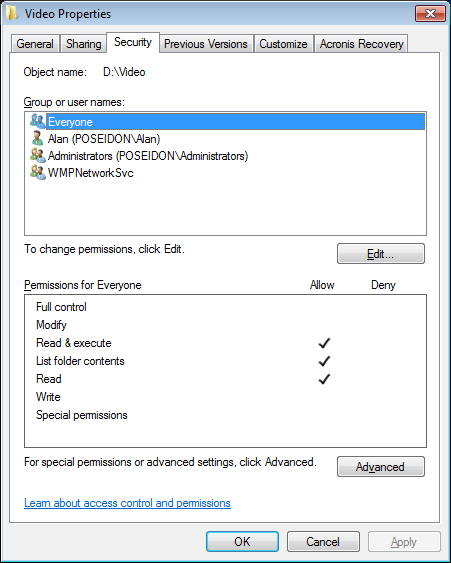 Modifying Windows file and folder permissions to enable Everyone to have read access. Modifying advanced file sharing permissions to give Everyone read access. The Everyone group includes all members of the Authenticated Users group as well as the built-in Guest account, and several other built-in security accounts like SERVICE, LOCAL_SERVICE, NETWORK_SERVICE, and others. The "local system account" I'd read about in my research on Serviio's forums might not be the same one I gave read access to, so I tried simply giving the Everyone group read permissions, and upon forcing Serviio to refresh its database of videos, it began churning through them and finally resulted in them being visible again via the TV. One drawback to doing this is that anyone else on my LAN would be able to access my video collection, given that the folder is now openly shared to essentially "everyone". I might need to ramp up the frequency with which I routinely change up my WiFi passphrase, but in the end this is no big deal.